Since 2014 is the Year of the Horse according to the Chinese Zodiac, crystal ball gazers might characterize their prognostications as “wins, places and shows.” But if you were keeping track in 2013, many such predictions finished out of the money or as also ran’s. The world didn’t end, there was no Second Coming, and closer to home, no BCS Bowl game either for the weary Husker fan. While the latter may have been the riskiest bet of all three, who amongst us would have predicted that a “do-nothing” Congress would be approaching a federal budget agreement in 2013? And who would have foreseen the resignation of Pope Benedict and the rise to power of Pope Francis, the “People’s Pope,” whom Time Magazine lauded as its Person of the Year? Yet, while one might add Go Big Red to religion and politics as subjects best left not discussed in public, let alone predicted, it’s not going to stop Metro fans and visionaries from hoping for the best and sticking their necks out. But if you are like many, and equate all of the above with winning the lottery—recent results in Gretna notwithstanding—than you may be looking for a sure thing in 2014 to put your time, money and faith in. The visual arts may not be everyone’s idea of a good time in the Metro, and granted it may not be on your wish list in 2014. But if 2013 was any indication, at least as appreciated in the 7th annual A-list posted online at thereader.com, it would be a shame to miss another year of worthwhile contemporary art events and exhibits as they appear to be shaping up. What follows are less predictions and more a promise that if you show up at the right place it’s a win-win for you and the Metro arts vibe at these planned events and exhibits. We can count on the major galleries, public and private to offer up a worthy calendar of exhibits as they did the past year…be sure and check out the OEAA awards event this Feb.16 at Doubletree Omaha for evidence of this…but the Metro’s three major arts venues will lead the way in 2014. This is especially true of the Joslyn Art Museum, which follows its much-appreciated new, free admission policy with a renewed interest in contemporary art and regional artists. Its recently installed Riley Contemporary Artists Project Gallery will feature Iona Rozeal Brown, Feb 8-May 11, who will create a mural whose imagery and technique draws from many sources including hip hop, Japanese woodcuts, comic books and Byzantine icons. The Riley CAP Gallery will then show paintings and the film, “Street,” of James Nares from June 21 to Sept 1. Installation artist Orly Genger will follow in Oct. 18 with her bronze and monumental sculpture, but all of the above are just “prelude” to Joslyn’s biggest event and exhibits in 2014 and 2015. Perhaps Joslyn’s biggest event of next year is the anticipated Andy Warhol in Living Color: Contemporary Prints from the Collections of Jordan D. Schnitzer, which opens Oct. 4 and runs until Jan. 11, 2015. Later that year, May 30, the museum will open its first “Art Seen: A Juried Exhibition of Artists from Omaha to Lincoln. Joslyn curator Karin Campbell and Bill Arning, director of the Contemporary Arts Museum in Houston will jury the show, which will close Aug.1. Another regional artist will receive even greater attention as Joslyn and the Sheldon Museum of Art collaborate with Keith Jacobshagen: Retrospective, 1995-2015, which opens Aug. 22, and closes Oct. 25. Kaneko/Open Space for Your Mind has several events and exhibitions planned in 2014 devoted to promoting creativity in the Humanities. The venue begins the New Year with a photography exhibit, no strangers: ancient wisdom in the modern world on display from Feb. 7 to May 2. Curated by ethnographer Wade Davis, no strangers features imagery of indigenous and endangered cultures from Borneo to the vast jungles of Latin America and from Mongolia to the Kalahari Desert. This show will share the stage with Photographers and the Plains Indians, curated by Nebraska State Historical Society, as it focuses on indigenous cultures in this region. This spring, if not sooner, Kaneko’s neighbor to the west, the Bemis Center for the Contemporary Arts will officially welcome its new director of arts projects, Amanda McDonald Crowley. Presently serving the venue as a planning consultant, Crowley and Bemis Director Adam Price will announce at that time a shared vision for Bemis which will place an increased emphasis on collaborating with area artists, curators and the community at large with its exhibitions, events and its residency program. Though Bemis has nothing new by way of exhibitions in 2014 on its website, its current shows, Lossy and Mel Ziegler: An American Conversation, will continue until April 26 and Mar. 1 respectively. Meanwhile, Bemis’ commitment to its internationally famous residency program and to its association with the successful Carver Bank venue in North Omaha will continue as two of its core strengths. One of the biggest events on the Metro art’s horizon continues to be MONA2Omaha, the recent collaboration of Omaha’s Gallery 1510 (it’s location on Leavenworth St.) and the Museum of Nebraska Art. It is gallery director Pat Drickey’s intent to “have at least two MONA exhibitions each year,” but he is quick to point out that the venue’s mission is to focus exclusively on Nebraska and regional artists elsewhere as well. To that end Gallery 1510 will offer exhibits in its new, eventual, 10,000 sq. ft. expansion space to artists “who need exposure to achieve the public recognition their work deserves.” Drickey will also work with the art departments at Nebraska state colleges and universities to host senior class exhibitions as well as competitions on behalf of the Nebraska Chapters of the Omaha Federation of Advertising and the American Institute of Architects. In Lincoln, the Sheldon Museum of Art will begin a search for a new director after the departure of Daniel Veneciano who will become Director of New York’s El Museo del Barrio as of March. Meanwhile, Sheldon has scheduled two interesting exhibits’, which open in January, ArtWork, Art and Labor and Mary Riepma Ross: A Personal Collection, both of which continue into May. For a more alternative experience in the Capital City, be sure and catch the new gallery space, Fiendish Plots at 2130 Magnum Circle for its next show, April 11-May 11 highlighting international artist Chrysanne Stathacos who brings together printmaking, photography, video, and installation in various ways, often creating participatory public art projects. The Metro enjoys the benefits of three arts organizations devoted to education and enlightenment: The Kent Bellow Studio, Omaha Creative Institute and the Union for Contemporary Art. KBS will begin 2014 under the ownership and guidance of the Joslyn Art Museum and current key staff, programs, and operations will fold into the larger venue. Scheduled events and shows are pending. OCI will continue its workshop schedule in several mediums, details at its website omahacreativeinstitute.org. It looks forward to its second annual Spring Fling, April 10 at Alley Poyner Macchietto Architecture with multiple workshops and much more. U-CA will add to its Fellowship residency program in 2014 and begins its exhibition season, Jan 17 at 6 p.m. with Every Cloud Has a Silver Lining, featuring installation artist Ying Zhu at its new gallery space at 2221 N. 24th St.
Several of last year’s best exhibits were seen in the galleries of the Metro’s universities and colleges and 2014 looks promising as well. The UNO Fine Arts Gallery has scheduled Paintings & Drawings by American Muralist Louis Frederick Grell to open Jan. 17 and close Feb. 20. Creighton University’s Lied Gallery will feature sculptor Littleton Alston in his show Hannibal, which open Feb.1 and runs until Feb. 28, and painter Christina Narwicz in her exhibit opening Mar. 7 and continuing until April 3. 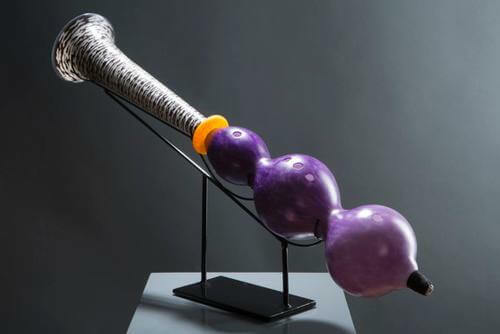 Meanwhile, the Hillmer Gallery at the College of St. Mary’s offers a show of Iggy Sumnik’s sculpture from Jan. 30-Feb. 28 and Joe Pankowski: Drawings, Mar. 20 to April 17. Two other galleries in the public sector include: Fred Simon of the Nebraska Arts Council, which has completed its 2014 schedule of exhibits highlighting Bill Hoover and Jerome Duba in Mixed Media & Ceramics, Jan. 27-Mar. 7; Peg Pennell and Lora Rocke with Textiles, Mar. 24-May 2; Rebecca Hermann and Annimutts with Installation and Animation, May 19-June 27 and Michael Giron and Riccardo Marchio, July 14–Aug.22; and the Sunderland Gallery of the Cathedral Arts Project will show Landscapes of Jennie Homan, from Feb. 16–Mar.28 and Winnebago Images from photographer Don Doll, S.J., April 13—June 8. The private sector will not take a backseat in 2014, as the Metro’s three full-service galleries, Modern Arts Midtown, Gallery 72 and Anderson O’Brien have scheduled key exhibits in the spring. Highlights include: solo shows of artists Lynn Pipher, Cathy Palmer and Jeff Balthus with a cast of supporting characters at MAM in March, April and May respectively; Gallery 72 has two interesting group shows in January (Cory Broman, Eliska Greenspoon, Simeon Lisk and Robert Miller in Visual Textures) and February (Michael Johnson, James Hendrickson and LeMont Hamilton in A Suite of Photographers) and March will exhibit Duplicity, pastels and oil paintings from Sonny Gibbons. Hot Shops Galleries, besides the OEAA nominees’ show in January, will host a two-person show in April with James Freeman and Jeff Yoachim; the featured exhibits at the Dundee Gallery include cut paper artist Angie Pickman in January, a 7-Year Anniversary in March and the colorful paintings of Karen Schnepf in April; and the Hoover Studio Gallery will exhibit Maggie Weber, opening Feb. 21 and Shea Wilkison, beginning April 25. A big shout out to the alternative Benson First Friday galleries and these winter/spring exhibits: The Sweatshop Gallery will begin its exhibition season in February with a group print show called BRASS TAX curated by Pat Oakes, March will feature Derek Courtneys’ large scale mid-century American-inspired works and in April Bonnie O’Connell will curate a group show devoted to visions, dreams, obsessions and enchantment. And the Choice Gallery in Benson has scheduled Revenge: Mythical Beasts II for Feb. 7, Just for Kicks, featuring drawings of J. J. Carroll Mar. 29 and The Birds & Bees later in the Spring which exhibits drawings from outsider artist, William Dorfler.